NFL punishes Jonathan Dwyer and Greg Hardy for domestic violence charges. 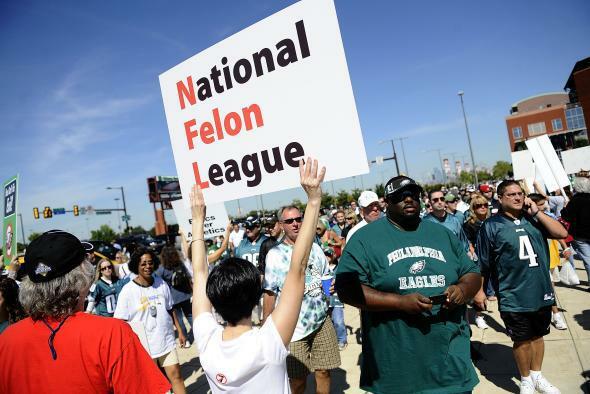 The NFL’s legal troubles continue. As the NFL grappled with the fallout from allegations of child abuse levied against Vikings star running back Adrian Peterson on Wednesday—just days after the suspension of Ray Rice for domestic violence—one might reasonably wonder: How could things get worse for the league? Here’s how: Greg Hardy and Jonathan Dwyer. Police said Dwyer was arrested Wednesday at the team’s training facility in Tempe on allegations stemming from two incidents that occurred on two days in late July at a southeast Phoenix home involving a 27-year-old woman and an 18-month-old boy. The woman did not report the incidents until Sept. 11, said [Phoenix police spokesman Trent] Crump. Dwyer was booked into the Fourth Avenue Jail on suspicion of aggravated assault against the woman for fracturing a bone and aggravated assault against the child for throwing the shoe toward the toddler, Crump said. The Cardinals back also faced allegations for preventing the use of a phone and criminal damage for property that was damaged or destroyed during the July incidents, he said. The Cardinals immediately deactivated Dwyer from all team activities and released a statement Wednesday evening: “We became aware of these allegations this afternoon when notified by Phoenix police and are cooperating fully.